Leucadendron plants have a simple and no frills flower appearance. Their simplicity is what makes them popular for gardens and bouquets. They will flower for many years once they have ideal conditions. These are tough and durable plants that can survive high winds. They are an exotic bloom native to Australia as well as South Africa. They are appreciated for their appearance and used in arrangements. L. album is a tall evergreen shrub that produces flowers every year. A single flower will typically appear per stem that has been grown. It can be found in the wild on slopes that have well drained soil. There are many other species available though many face habitat loss. This habitat loss has led to them becoming an endangered species. Those that are endangered are placed on a protected species list. Only species that have been widely cultivated may be harvested. This may include hybrids that are available for home garden uses. Non native species may also be available in some of the world. Proper drainage is crucial for leucadendron plants to grow properly. Some may plant them on a slight incline to encourage better draining. Others may prepare the soil and add elements to enable it to drain. Soil that remains moist for too long can cause problems with rotting. Soil that dries out too quickly can also cause wilting or drooping. Over watering is a common problem in some climates with heavy rain. Full sun is ideal, and the sunniest spot possible should be used. This may be along a house or fence line, or near a sunny patio. They may also be placed further out in landscaping where it is sunny. Windy locations can often lead to better and sturdier plant growth. New plants may need to be staked until they have reached maturity. This will help prevent the young stems from breaking in the wind. Acidic soil is preferred and some fertilizers may lead to scorching. Feeding is generally not necessary after they have been established. It is recommended that the plant have compost around it as well. 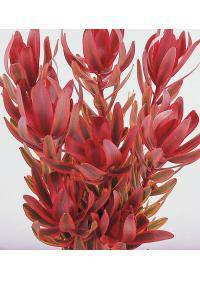 Whether for plants or for bouquets, Leucadendrons are usually available in the Austin, TX, Simi Valley, CA, Norwalk, CA, Denton, TX, and Chula Vista, CA areas. Since this is an exotic flower, it may need to be ordered in advance. Simple beauty is one of the most popular meanings for this bloom. The blossoms are uncomplicated and have a simple appearance to them. They may be used alone or paired with dark green foliage for bouquets. They are often used to convey an appreciation for simplicity in life. They may be used when someone has suffered a loss of a loved one. They may also be used after another type of loss has occurred in life. Another possible meaning is one of paying a compliment to someone. The flower can symbolize a compliment on beauty or a job well done. This meaning can be adapted to fit nearly any occasion or event. One way to alter or enhance the meaning is to pair it with blooms. Doing so can lead to a compliment on love, luck or new prospects. This can be a popular option when creating an exotic bloom bouquet. The pink and red colors can also be taken to symbolize passion. This meaning can lead to them being used for romantic arrangements. Leucadendron used in this way may also mean a simple love of beauty.